The Pediatric Hemodialysis Unit (3E) provides hemodialysis treatment to children and youth from 0 through 17 years of age. It is the only dedicated pediatric hemodialysis program in south-central Ontario, also serving parts of Western Ontario. Patients are admitted following an incident causing kidney failure or if they have end stage kidney disease. 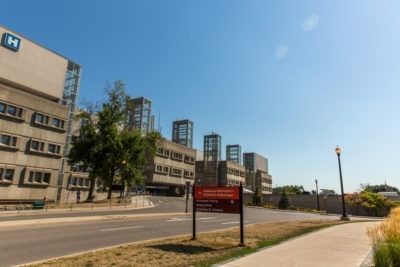 Admission to the Hemodialysis Program follows admission to McMaster Children’s Hospital and consultation with a nephrologist (doctor specializing in care related to the kidneys). You are welcome to bring personal items for your child, such as a favourite toy. Other items including books, activities, and music are available on the unit. Make sure your child eats and drinks before you arrive for treatment are there is no eating allowed during treatment. Please bring your child’s favourite clear fluid drinks. Please ensure that your child wears a top that buttons in the front for easy access to the catheter. We encourage you to take part in your child’s care and to tell the team if you have any questions, concerns, or notice any changes in your child’s condition. It is important that you are on time for appointments. If an emergency or bad weather prevents you from coming to hemodialysis please call and let the nurse know as early as possible. The doctor will determine when your child’s next treatment will be and if they need any medications while waiting for the next treatment. If your child is in school, tell the school staff of your child’s dialysis schedule. It can be helpful to provide them with information about the hemodialysis catheter and its care. The team would be happy to provide you with information if you wish. On non-treatment daysduring business hours call the nephrology nurse atext 73855 OR page the hemodialysis nurse atnd ask for pager 1280.